Yesterday was Peyton's 7th birthday! It was also my mom's birthday! We celebrated with a birthday party Saturday and Peyton had a great time. I made Peyton a birthday banner with photos from the past year. In order to get her to pose for a "nice" photo I usually have to make a deal that you can also do a "crazy" photo! Works every time! Peyton had her "friend party" earlier in the day so there were only a few kids (one friend and cousins) at the family party but you would have thought there were 20 kids by how loud and hyper they were. I convinced them to do this puzzle which kept them quiet for about 15 minutes. We also played UNO which Ella is surprisingly good at! Peyton got plenty of fun gifts including a doll named Peyton, things from the American Girl Doll store and a giant stuffed dog (see below)! Peyton is a huge dog lover so it was only appropriate that Jenn made her a paw print cake! Since it is also my mom's birthday we sang to her too. Ella joined her to help her blow out her candle. 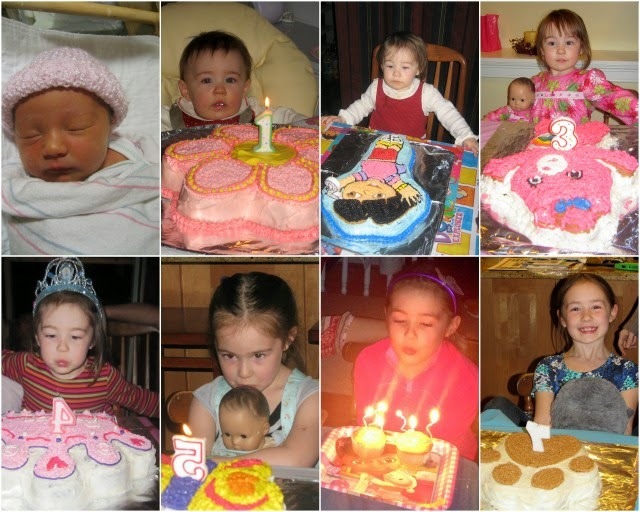 Since I am a sucker for comparison photos I had to throw together this collage of Peyton on each of her birthdays! From 0 to 7! Here's to many more Happy Birthdays for Peyton and my mom! Linking up with Leeann for Monday Morning Gossip and with Biana for Weekending! I love, love that banner you made! So cute! Happy birthday to Peyton and your mom! Love the photos at the end from birthday's past!! Isn't it amazing how fast time flies!! I'm trying the one nice photo for one crazy photo trick! I love the birthday banner! Looks like it was a lot of fun. Looks like a good birthday party, I want that huge dog for myself! Love that Banner! And THAT IS A HUGE STUFFED DOG! WOW-EEEEE. I love the yearly comparison photos as well - Such a wonderful idea. I, also, have to take a crazy pic and then a nice pic of my son. It does work like a charm!!!! 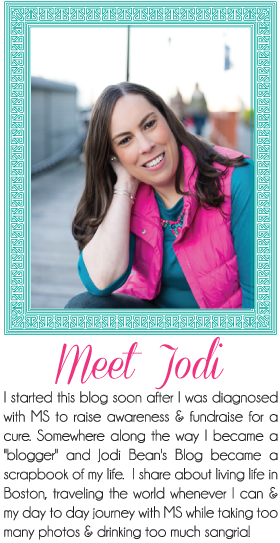 Can't wait to read more from a fellow mama blogger! How she has grow, so fun! I love the paw cake. My niece is the same in that she always wants to take a goofy picture. The birthday banner is so pretty!! I just love it. I’m incredibly inspired by your work dear. Thank you so much for the photos. At some indoor party LA venues I will also be hosting a grand party on my nephew’s birthday in the next month. I am really excited!